Last season’s Chelsea squad couldn’t score. With no dangerous striker up top, Mourinho’s tried-and-true defend-and-counterattack philosophy was incomplete. Fernando Torres, Demba Ba, and Samuel Eto’o all took turns struggling to find the net consistently. This was an issue for a team that had significant title aspirations. After finishing third in a highly winnable Premier League table, they made some changes. Those changes have turned out to be the right ones. Take yesterday’s dispatching of Arsenal at Stamford Bridge. Chelsea’s two goals revealed their main offensive threats and how they can hurt you at almost any moment. The first came after a brilliant, winding, on-the-ball run from Eden Hazard, who scythed his way into the heart of the Arsenal defense before getting hacked down in the box by Laurent Koscielny. We’re getting used to seeing these kinds of individual heroics from Hazard, who finished the job by converting the penalty. The second goal showed off their two offensive imports from La Liga, Diego Costa and Cesc Fabregas. Playing against his former club, Fabregas (7 EPL assists already) sent a lovely long ball over the Arsenal back line on a Chelsea counterattack. Of course Costa (whose intelligence on the pitch is underrated) was there to receive it and flick it home over the keeper Szczesny. That’s already Costa’s ninth Premier League goal, which easily outpaces the rest of the pack. Mistakenly, I thought Costa would be a solid, although not sensational, addition. Instead, he’s been every bit the forward Chelsea were missing last campaign. That second strike was a perfect exhibit of their remarkably effective counterattack, which is even stronger this season with Fabregas and Nemanja Matic holding down the midfield. This team has the same wily and wise Mourinho at the helm and the same stout defense (only Southampton has let in less goals so far) at the back; it’s just now they have an elite, varied, and explosive offense at their disposal. I’m not sure you can fault Wenger much for his team’s loss here, at least not with his tactical decisions. He trotted out Wilshere and Cazorla to cover Flamini in the midfield, a mostly conservative choice trying to avoid that Chelsea counter. The main issue was his defense. 19-year-old Calum Chambers was routinely outmatched by Hazard on Arsenal’s right side and Kosicelny had obvious problems handling the Chelsea attack up the middle. It’s not like the offense was anything to write home about though. 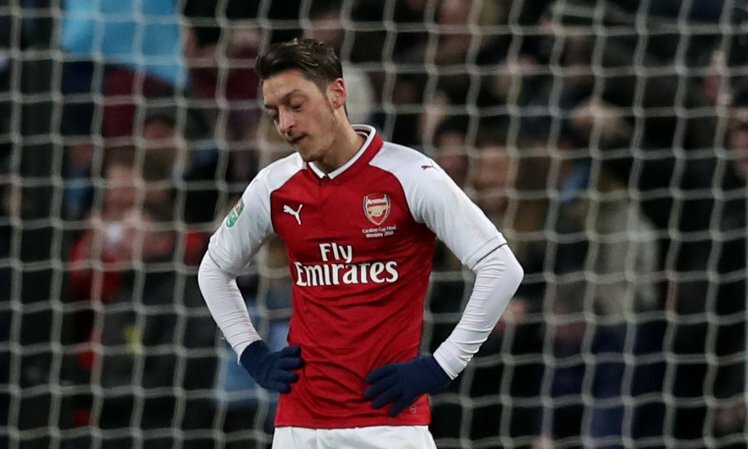 With ten shots and zero on target, Welbeck, Alexis, and Ozil were listless up front even though they had the majority of the possession. Going into the Bridge and losing 2-0 isn’t the worst thing ever (not like that 6-0 thumping last season), but Wenger’s men certainly didn’t show they were prepared to threaten at the tippy-top of the table. However, Wenger himself got fiery after a 20th-minute cynical take down of his star Alexis by Chelsea back Gary Cahill. 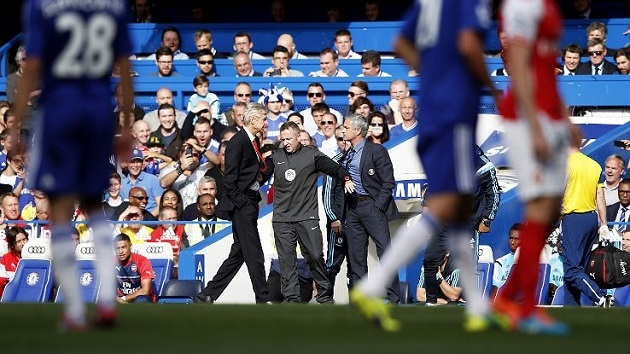 It was nothing more than a little scuffle that featured the slender Wenger slightly pushing the shorter Mourinho, who then proceeded to flip Wenger’s tie and motion for him to recede to his box. Any time two managers get physical the media will gobble it up, but this one was especially juicy. Considering their history, which has contained acidic quotes and Mourinho refusing to lose to Arsenal, Wenger has got to be more than perturbed at the Portuguese coach. This time his frustration boiled over even before Chelsea had taken the lead. Mourinho’s new offensive toys are frightening, but so is the fact that Chelsea’s defense is still intact and tough to beat. Somehow the 2013-14 version only conceded 27 goals in 38 games, a ridiculous stat. So far, despite on pace to score considerably more, they have just let in one per game through the first seven matches. This is not good news for the rest of the EPL. Also ominous? The defensive depth Chelsea boasts. Their back line thrives off continuity, experience, and chemistry, with Terry and Cahill anchoring the center and Branislav Ivanovic patrolling the right side. New addition Filipe Luis hasn’t been able to unseat left back Cesar Azpilicueta, but he has been dispatched by Mourinho for both Champions League tilts and was one of the better players on the field for the Blues. Youngster Kurt Zouma still awaits his shot at center back behind the stable Terry-Cahill duo, and you can’t forget about the best backup keeper in the game, Petr Cech. Starting netminder Courtois left the Arsenal match after Alexis collided with his head, apparently causing him to bleed from the ear several minutes later (yikes). This caused Chelsea’s “good problem” to rear its not-that-ugly head when Cech had to enter the game. The only happenstance in which Chelsea would have a reason to panic would be a Costa injury. If that were to occur, they would be back to square one at the striker position, with only Loic Remy and 36-year-old Didier Drogba to trot out. 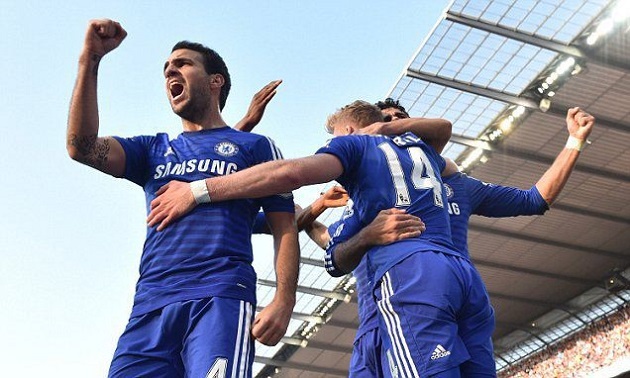 Other than that, Chelsea look supremely confident and scary-good. We should start hoping now that the title-race drama doesn’t get sucked out of this young season. Are Wenger’s Days Finally Numbered?